It may seem as if basic or flip phones are a thing of the past, given that 73% of teens have a smartphone. But that still leaves 15% of teens who only have a basic cellphone and 12% who have none at all, and it makes a difference in the way each group communicates, according to a recent Pew Research Center study. Texting is an especially popular way for smartphone-using teens to communicate with their closest friends, while teens without a smartphone are more likely than their smartphone-using counterparts to use social media and phone calls as their preferred ways for connecting with their best pals. Teens who have a close friend were asked to name their most common method of getting in touch with their closest friend. Texting is the number one way all teens get in touch with their closest friends. 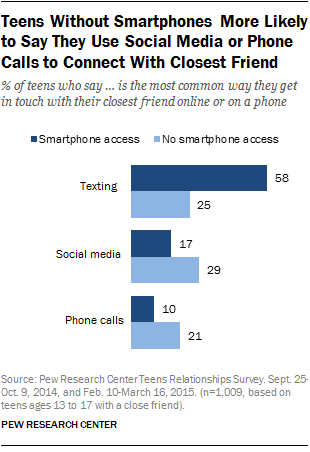 Some 58% of teens with smartphones cite texting as the main way they communicate with their closest friend online or by phone, compared with 25% of teens without smartphone access. On the other hand, non-smartphone-using teens are more likely than those with smartphones to keep in touch with their closest friend via social media. Some 29% of teens without smartphone access cited social media as their most common online or phone method of communicating with a best friend, compared with 17% for smartphone users who did so. Talking on the phone is also more common among the non-smartphone group, with 21% of these teens saying they make phone calls to their closest friend as a primary mode of keeping in touch, double the share for smartphone users. Outside of the different communication channels that teens use to interact, having a smartphone helps teens more frequently stay in contact with their close friends and forge new relationships online. Smartphone-using teens are more likely to be in daily contact with their closest friend than teens without smartphone access (62% vs. 51%). They are also more likely to have made a friend online: Six-in-ten teens with a smartphone have made at least one friend online, compared with 48% of those who do not use smartphones. 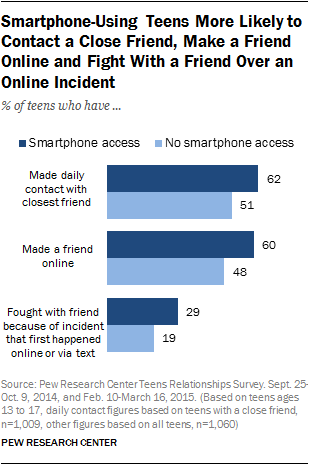 There is also a bit more drama associated with smartphone-using teens. They are more likely to say they have argued with a friend about something that first happened online or via text than those who do not have a smartphone (29% vs. 19%). But having a smartphone, and the constant access to the Web it provides, does not mean that teens are not interacting with their close friends face-to-face. In fact, teen smartphone users are more likely to say they spend time with their closest friend at a number of in-person activities, including at school, at someone’s house or while shopping. Non-smartphone-using teens are more inclined to interact with their best friend at a place of worship, while there is no difference based on extracurricular activities such as sports and clubs, in a neighborhood, at work or online.